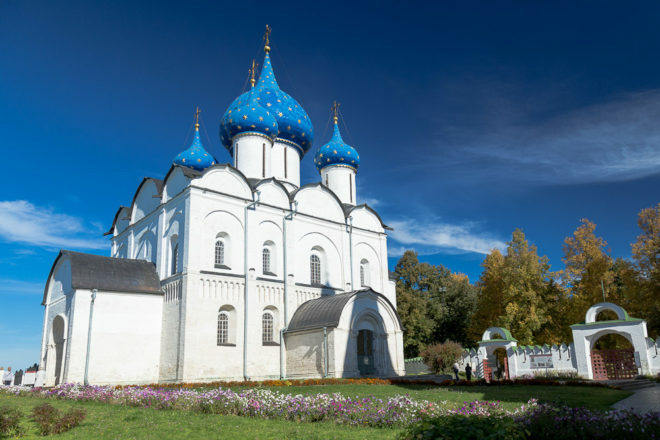 Cathedral of the Nativity in Suzdal, Russia. Russia’s Suzdal is a quaint little town with a very rich history. With churches, convents and a Kremlin, the architecture here is definitely worthy of a look – number 49 on our 100 Secret Gems You Need To Know About list. Some 200 kilometres north-east of Moscow. Part of the Golden Ring of quaint towns north-east of Moscow, Suzdal was the capital of the Rostov-Suzdal principality in the 12th century. Having avoided the industrialisation that blighted much of Russia during the Soviet era (it was bypassed by the Trans-Siberian railways in the 19th century despite lobbying by locals), the town is dotted with stunning historic Russian architecture, including blue-domed churches (the Nativity of the Virgin Cathedral), monasteries, and its very own 10th-century Kremlin.